I’m always trying to wrap my head around ways to integrate current literature and science about injury prevention into gymnastics training. One of the areas I have spent a lot of time thinking on is growth and development tracking, and how it relates to injury risk in maturing young gymnasts. I think if we combine tracking growth profiles with movement screening, objective data on training volume, some of the current research on gymnastics injury mechanisms, and gymnastics injury data projects like Dr. Sands is working on, it can have a huge impact to make a dent in injury risk while also helping optimize a gymnast’s long-term performance. 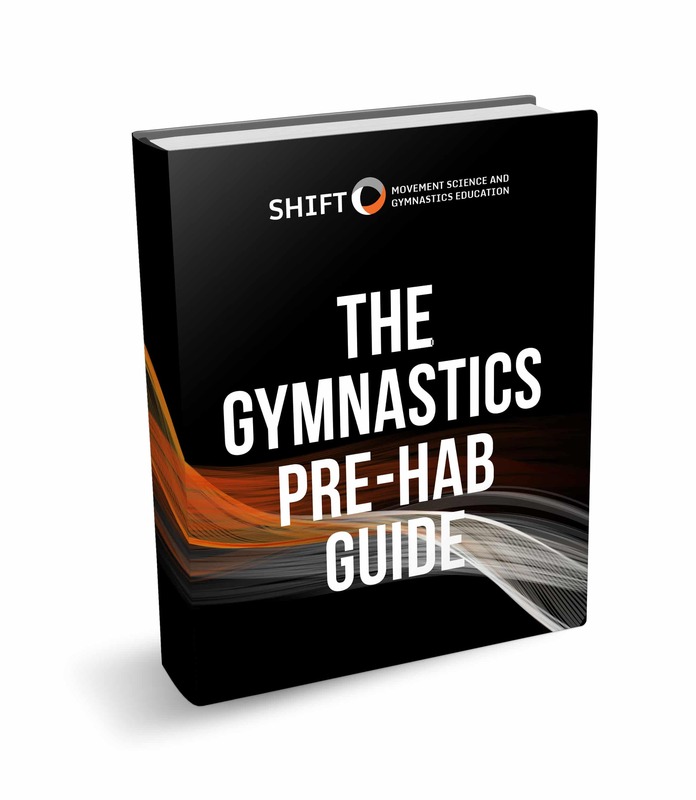 Before I share lots of more information, remember you can download my entire free “Gymnastics Pre-Hab Guide” that goes in depth into growth tracking, along with tons of preventative care for common gymnastics injrues. Full video guides and checklists included. The Canadian Sport For Life website has a lot of work in this area, as well as people like Istavan Bylai and Richard Way, in relation to a concept known as Long Term Athletic Development. I’m going to offer some of my thoughts based on what I have read/studied so far, but I certainly have more to learn on the topic. I encourage people to read the resources for themselves including newly release book Strength and Conditioning For Young Athletes, Bayli and Way’s fantastic article on The Role of Monitoring Growth in Long-Term Athlete Development, and the Canadian Sports For Life Resource Page for more information. Here are some thoughts on what’s been floating in my head and some of my plans to start building this into our gymnastics program this summer. One of the most important ideas I have applied to both gymnastics coaching and my clinical work is that there is a huge difference between an athlete’s chronological age (related to number of years from birth) and their developmental age (degree of physical, mental, emotional maturation). This is crucial to understand if you work with gymnasts or younger athletes. You can have five “10-year-olds” in front of you that all have the same chronological age but developmentally you may have a 9-year-old, two 10 year olds, an 11-year-old, and a 12-year-olds. It all depends on their individual growth profiles and when they happened to start going through their growing phases. Speaking in terms of their musculoskelatal, psychological, endocrine, and neurological systems there may be some pretty big differences for a 9 year old versus a 12 year old. This greatly influences the state of their motor skill development, their psychological and emotional status, how much/what type of training they can tolerate, and also what their response and adaptions to a training stimulus will be. Tracking growth and height aspects can help give insight to the tempo of maturation an athlete is going through. The rate of growth and development can be extremely variable from athlete to athlete. There are specific ways to test this like bone testing, in-depth growth factor tracking, and endocrine testing, but the feasibility of that in a gymnastics training setting is obviously a challenge. Tracking height and body dimensions are a more practical ways to apply this concept to gymnastics training, in an effort to get a general sense of the athlete’s developmental age and growth tempo. As is seen in Bayli’s work, they offer the non invasive and simple method of using body height dimensions to plot growth curves that helps follow these concepts. It’s based off of measuring dimensions like standing height, trunk height, arm/leg lengths at regular intervals then plotting growth curves based off of the information. With some education, training, and practice both coaches and healthcare could easily be involved in this with gymnasts. Related to knowing their developmental age is the idea that there are certain times when athletes will go through rapid changes in growth, commonly called “growth spurts” by most people. There is also generally a time when they have the most rapid change in growth/development, known as a “Peak Height Velocity” (PHV). By tracking someones overall height, torso length, arm length, and leg length from an early age you can notice big changes in patterns to monitor/track growth spurts and possibly PHV. 1) From a body systems point of view, the tolerance of new developing tissue in bones, tendons, and cartilage may be lower during rapid growth. As new tissue is laid down, it’s ability to accept load isn’t as good as fully developed tissue. With a high force sport like gymnastics, it can be very easy for the forces of gymnastics to be greater than the tissues ability to handle the load leading to and overuse type injuries. This is commonly where issues like Severs disease, Osgood Schlatters, growth plate irritation, or other injuries may pop up. Also, long bones may rapidly grow and the associated connective tissue in muscles, tendons, and ligaments may not be able to proportionally keep up leading to loading capacity problems. 2) From a neurological point of view, the body rapidly changes dimension, shape, and density with these rapid growth spurts. I refer to it as a “recalibration” phase that has to occur for the brain and nervous system to understand these changes in length and dimensions. It’s very common for gymnasts to go through a stage of feeling awkward with movements that were once fluid, as well as perceive a decrease in skill performance during this time frame. Being able to understand this concept helps me quite a bit both in the gym coaching and in the clinic treating gymnastics patients to explain some injuries and why I encourage so much preventative work in younger age groups. I think it’s important gymnasts know what’s going on during growth, but it’s also important for them to be really aware of the start of an injury during this phase. Frustration with skill work, fatigue, and the “recalibration” process happening in a changing body can all make a big impact on injury risk during training. 3) From more of a gymnastics sport point of view, the 9-13 range is very commonly a time when many gymnasts start to think about moving up in the levels and trying to advance their skills for optionals. Usually gymnasts identified as being naturally talented are recognized at a young age and pushed rapidly along the training continuum. This move up in levels comes along with more training hours and more days per week training. The gymnast is also likely training higher level optional skills that are more demanding on the ranges of motion for joints, require more strength, and also may have higher forces associated with them (double back versus back 1/1 on floor). Again, this concept has a big role to play in keeping track their training volume and preventing overload injuries. In quite a few younger patients I work with, shoulder and lower back injuries became the most problematic during their biggest growth spurt. The point of this entire article aside from education is to highlight the idea that I think in gymnastics we can use all of this great information about tracking growth and development in our athletes. It can be combined and used for a method to hopefully predict times when a gymnast may have an elevated injury risk and possibly struggle with skill performance. From here we can proactively make changes to training based on possible rapid growth changes. During this time we can also encourage more preventative work to mitigate overuse injury risk and screen more regularly catch an injury as soon as it starts, or ideally avoid it all together. I feel being aware of chronological age vs developmental age and tracking growth tempo through objective data from a young age is extremely important for gymnastics. We can use this information and build it into more screening/preventative measures to hopefully combat injury rates and plan for long term development. I feel a good team of coaches, parents, strength coaches, and healthcare working together can go a long way here to help gymnastics everywhere. This growth and development profile is something I’m going to start tracking for our younger pre team and compulsory gymnasts when I run screens before summer training starts. I take 2 days each year and screen our entire gymnastics team with the FMS, my gymnastics specific screen, and more dynamic tests all looking at motor patterns or possible injury risk factors. This summer I am going to start measuring height and torso/extremity measurements our pre-team and compulsory gymnasts. My hope is that by having a database for their height/growth, I can put the data into an algorithm and be alerted to rapid changes in growth during spurts or if someone is approaching Peak Height Velocity. In the short term this type of information can be used to alert their coaches to be aware of it incase they complain of pain or struggle with training. Then also long-term I will have an idea of their growth profile over multiple years and when they get to the optional level training on our team I can have a feel for who is an early or late maturer. I understand there are many challenges with this type of approach. It can be a hassle to learn these ideas and implement them regularly. Along with this I get that young gymnasts just want to train, get new skills, and compete. However, we are working with young developing kids in a demanding sport. Due to this we have to have some objective measures to follow where they are at developmentally and always have their health on the forefront of our minds. From here we have to choose our battles and know when to push or pull back in training. I have had this discussion countless times with patients to “see the forest behind the trees” understanding that de-loading their training temporarily to focus on more quality vs quantity for skills, more drills/technique work, strength, and preventive work can pay off 10 fold down the road when they aren’t dealing with an ongoing overuse injury that keeps popping up.Growth and development tracking is just one piece of the puzzle, but in my mind an important one. So thats all for now, I’m hoping that once I start to get through some trial and error with screenings/tracking I can post on some tips for how to practically apply it during gymnastics practice. Back to the breathing article series next week, have a great weekend!